i tried something a little different this time, unintentionally. 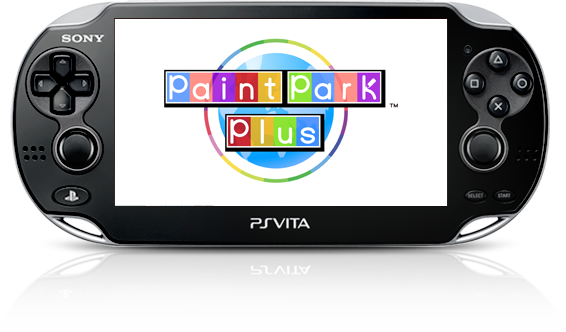 Sony launched a paint app for the Vita called Paint Park Plus (I Googled for a review and found one here). I downloaded it because it was free, but quickly found myself paying a few bucks to unlock all of the tools and colors it had to offer. I hear it's not much compared to the other apps available on the Vita and iPad, but I had fun with it. I'd been curious about digital art, but wasn't willing to shell out for a tablet or decent software, so this worked out just fine. I'd been wanting to do something anime-ish, and it had also just occurred to me that every character I'd drawn so far was male. 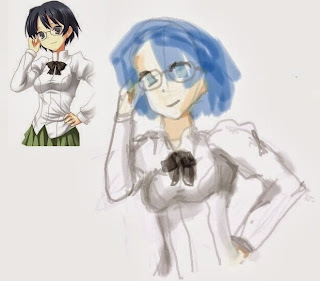 So when thinking of female characters to draw, my mind automatically went to Katawa Shoujo. 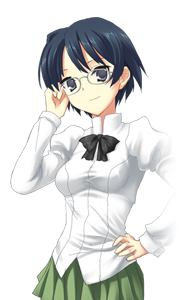 Of the 5 girls from the game I picked Shizune for this first attempt because I liked her design, but her story wasn't one of my favorites. That seemed to make it just right for messing around. I really hope that makes sense. The result was ... let's say interesting. I'll pin my reference image to the corner. You can view a (somewhat) larger one here. Ctrl + MWheel Up is your friend. I'd had to use the Vita's web browser to look up the reference image, and had to switch between the two apps constantly. I eventually got tired of it and tried to draw it from memory, so it's not a 1:1 copy. I'm not all that satisfied with it, but it definitely could have gone worse. This was the first time I'd ever done art digitally, and Vitas aren't meant to be used with stylus..ses. Styli. So I was using my finger, blocking the image as I was trying to draw it. The app does try to compensate for this; depending on where your finger is, the app will use the opposite side of the screen to show you a secondary view of what you're doing. I wasn't expecting to like drawing on a touchscreen as much as I did, but it was a lot of fun. This was drawn over about 1.5 hours beginning at 11:00 PM at night, lying in bed with my head semi-comfortably propped up. I kind of wish I'd worked on it a little more before posting, but I like the idea of posting it as-is after doing one block of work on it. For a drawing that was done entirely with one lazy index finger, I think it came out great.